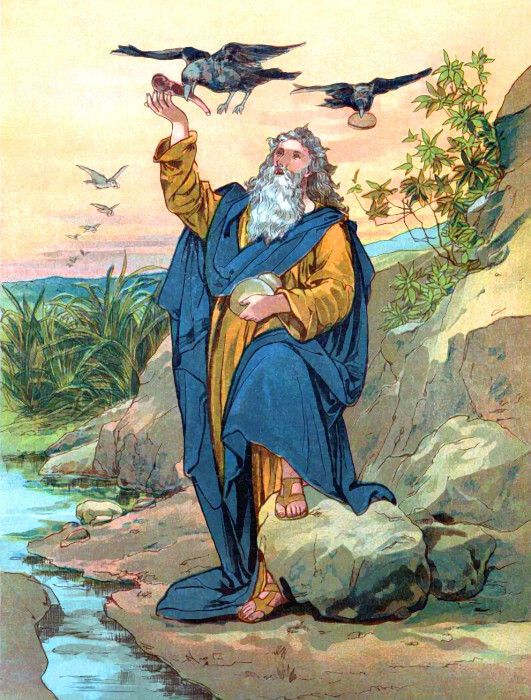 This week the thought occurred–why did the Lord promise to bring the anti-typical “Elijah” as the last prophet instead of say, Noah? Or Deborah the prophetess, for example? The last suggestion begs a timely review because we, as Seventh-day Adventists, have been largely led, falsely by our past leaders, to believe that Ellen White was the “Elijah” to come as prophesied in Malachi 4:5. Let us look more deeply into why the Lord decided to send some one who would exemplify and typify the original Elijah of the Scriptures. Before we do let us briefly look at why He did not promise to bring Noah for example. We know well the basic story of Noah. He was found to be walking upright by the Lord and the Lord used him to warn the evil world to repent or die. But Noah did not face a specific group of God’s people, ie. His chosen people. He faced the world, the heathen world. True, there is to be a great last proclamation to the world–the great Loud Cry, but that is after His Elijah does the ant-typical work that the original one did. Back to our Deborah idea. As mentioned many times in our posts, the Satan trick has been one of perverting the truth, and certainly this theory that Ellen White was the Elijah to come, does not disappoint for him. The SDA church has largely bought this idea, but there is some history that needs to be brought to view. As the word says, “And ye shall know the truth, and the truth shall make you free.” (John 8:32). The above quote originated in the 1890 and was put into her work, known as “Special Testimonies to Ministers and Workers, also known as “Special Testimonies, Series A.” Then in 1923, due to the high demand for a book that would have many of these special instructions, the first edition was made and called “Testimonies to Ministers and Gospel Workers.” The above quotation was added in this volume just as you see it above, pure and unaltered. In 1944 the second edition was completed. Again the subject quote was as shown. Now, we shall examine the trickery that those who fail to search for truth as golden treasure, become entangled in and ultimately can lose their way and thus fail to be sealed. We , as present truth believers know that Victor T. Houteff was the only clear and convincing SDA member to announce his message as that of Elijah through out our church history. Just as our prophetess never claimed to be a “prophet” (or prophetess) we well know she was by studying her writings, same with brother Houteff. The ones who take up his writings are simply “bowled over” with the spirit and power that accompanies his writings. Simply put, both writers exemplified a “higher knowledge” than what is common to man. A divine knowledge that surpassed their 3rd and 4th grade education level. You can only know this by prayerfully reading their works. History shows that after Victor Houteff died in 1955, a slow downhill developed. His wife , Florence, usurped the head office of the organization and it was all down hill sliding from there. To the point where ultimately she went apostate, in that she did not recognize either Ellen White or even her husband as legitimate prophets. Such was the scenery in 1962. “Everything that can be done against God’s message of today will be done with even a greater vengeance than was manifest against Heaven’s message in the days of Christ’s first advent, for the Devil knows that if he loses now, he loses forever — that he is to have no other chance. Unparalleled, therefore, is the urgency that every eleventh-hour church member now quickly and solidly brace himself against the Enemy’s effort to deliver a knockout blow. The knockout blow came in 1959. Florence Houteff and her handpicked counsel falsely predicted Ezekiel 9 to occur in April of 1959 and basically placed brother Houteff and the Lord’s Elijah message on the altar, sort of speak. Of course it did not happen and she and her cronies on her counsel were left shamed and disillusioned. Over one thousand believers came to the organization’s property in Waco Texas in April of 1959, many having sold everything, on advice of Florence and her counsel. Much as a professional boxer sees his opponent hurt and seizes upon the moment, to inflict further damage, so too did the unbelieving SDA leaders. This was their moment to strike, to put a final dagger in the Shepherd’s Rod message brought from the Lord through His messenger, Victor Houteff. So the SDA leaders at that time took full advantage of this fiasco. Just as Satan had planned no doubt. It was his workings, to be sure, that had been sowing the seeds for the Lord’s message and messenger to be much maligned .Thank the Lord, a small faithful group relocated to California and keep the Truth, His Elijah message, from collapsing altogether. So at this time, 1962, the third edition of the Testimonies came out. PAGE 475. SOMEBODY IS TO COME IN THE SPIRIT AND POWER OF ELIJAH: THESE WORDS HAVE BEEN MISTAKENLY APPLIED BY SOME TO SOME INDIVIDUAL WHO IT WAS THOUGHT WOULD APPEAR WITH A PROPHETIC MESSAGE SUBSEQUENT TO MRS. WHITE’S LIFE AND WORK. THE THREE PARAGRAPHS COMPRISING THIS ARTICLE TITLED “LET HEAVEN GUIDE” ARE ONLY A SMALL PORTION OF A TALK GIVEN BY ELLEN WHITE IN BATTLE CREEK, MICHIGAN, THE MORNING OF JANUARY 29, 1890. Then they go on to explain that Ellen White was really talking of herself as “Elijah”. But let us take note here. First, the original words of her writings were left untouched for approximately 72 years. Secondly, as mentioned above, when their opportune time came to put out any ideas of Victor Houteff being the true Elijah to come, they seized the moment. Third, not once during Victor Houteff’s ministry (1930 to 1955) did the denomination dare to even think of adding anything to that statement. Why? Because they knew brother Houteff would have exposed how ridiculous such a thought. Even prior to VTH (1890 to 1929), the denomination knew full well that EGW never claimed to bring the Elijah message, directly or indirectly. To believe that she herself believed that she was the Elijah, not only mocks Ellen White’s divine comprehension of the Truth, but mocks God Himself! For this would mean God decided to use the original male type “Elijah” to show a female anti-type with a female name–Ellen. True nonsense with no “obvious meaning”! As mentioned before, if God had designed that Ellen White would be the last messenger and the final prophet, would it not had made sense to say –“Behold I will send you Deborah the prophetess, before the coming of the great and dreadful day of the Lord.” ? At least the Lord would have not mixed us up with gender. Of course this all proves that those who follow such shallow reasoning of saying Ellen White was the Elijah to come, really are not being led by the “Spirit of Truth”. Ok, now that we’ve cleared the two possible scenarios of why God did not send Noah or Deborah, let’s look at the “why” of His decision to send the anti-typical Elijah. Why Elijah? Elijah , as we all know, was a simple man with great courage. But it is important to realize that he went solely to his own people. Elijah did not send his message to the heathen. This is another difference between Ellen White and Victor Houteff. Our beloved prophetess spent much time in her ministry giving her message to not only the SDA church but to the outside world, those not aligned with the SDA church. Books such as the classic “Steps to Christ” certainly were meant for ALL people around the world. Victor Houteff concentrated his message solely to the SDA church through out his ministry. Anti type doing the type in God’s fulfillment. Just as in Elijah’s time, our church as fallen so far from true worship and obedience to God’s word, that God saw that he would have to send the anti-typical Elijah to awake His people. Our church today, has basically abandoned Dress, health, worship,Sabbath and other reforms. Many of our pastors today even wink at abominations done in the midst, such as buying and selling on the Sabbath, short dresses,women without head covering, talking business on the Sabbath, etc, etc. But only those who are striving with all power God has given them to be among the 144,000 (RH, March 9, 1905), will clearly see all these abominations done in the church. “It is therefore only to be expected that the predicted Elijah will be denounced as a false prophet, perhaps even as the anti-Christ, offshoot, or what not…Every wind of doctrine will be blowing, false revivals and reformations will be at their peak. Everything that can be done will be done to distort the Truth and thus distract and dishearten believers and draw their attention to something other than the message of Elijah. Thus will be the Devil’s deal while the day of God is approaching, and while Elijah is making the announcement of it as the scroll unrolls and while the prophecies concerning the day of God are being unsealed. His work and his interpretation of the prophecies for the great day will identify him as the promised Elijah the prophet (“Testimonies to Ministers,” p. 475), and this will enrage the Devil as never before. This entry was posted on April 4, 2015 at 4:32 am and is filed under Elijah, Elijah Interpretations, Victor T. Houteff. You can follow any responses to this entry through the RSS 2.0 feed. You can leave a response, or trackback from your own site. Muy bien hermano, love the article.